Arsene Wenger showed with his capture of Mesut Ozil this past summer that he isn’t afraid to splash the cash on transfers anymore. However, it looks like he could land one of the league’s most impressive performers for nothing at the end of the season. 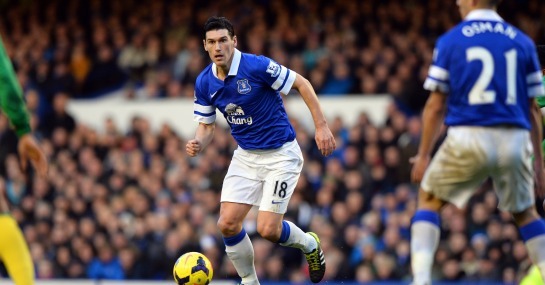 Gareth Barry has rediscovered the form that saw him play a vital part in Manchester City’s league win during 2011/12, but has fallen out of favour at the Etihad and was loaned to Everton for the entirety of this campaign. His deal with Manuel Pellegrini’s side runs out this summer and will be a free agent in high demand after an impressive season so far with the Toffees. Despite his aging 32-year-old legs, Barry has made 19 starts out of Everton’s 24 league games this season scoring three goals and laying on another three for teammates. His passing ability is being used to full effect on Merseyside, as he makes a team-leading 71 passes per game on average and completes 85.8 per cent of them. In fact, his form has been at such a consistently high level that the 5/1 on him making England’s World Cup squad looks cracking value. Barry’s performances certainly haven’t gone unnoticed in north London either, with Wenger said to be ready to bring the midfielder in after the season’s completion. The bid to land Barry was given a significant boost this January too, as the player turned down the chance make his stay at Goodison permanent, preferring instead to keep his options open for when his contract expires this summer. With the race for the top-four so hotly contested, Everton are 13/2 and part of a chasing pack behind Liverpool, Arsenal’s seemingly assured place in next season’s premier competition, at 1/16, could be the clincher in any future deal.